Our periodontists can completely restore all of your missing teeth with the Teeth-In-A-Day procedure. After Dr. Ryan Mendro and Dr. Lucia Roca Mendro place implants, they can attach a new set of teeth to the implants for a new, secure smile. Please call Precision Periodontics & Dental Implants if you would like to learn more about Teeth-In-A-Day in Winter Garden, Florida. Teeth-In-A-Day can be a great option if you are searching for something more comfortable and permanent than traditional dentures. Given that there are usually 28 functional teeth in your mouth, using individual implants to restore your smile is not only expensive, but impractical. Teeth-In-A-Day is a cost-effective and efficient way to replace your all your teeth. Our periodontists can often complete this procedure in a single day! Teeth-In-A-Day is a new set of teeth designed to fit on top of dental implants, providing a permanent hold that eliminates the slipping, looseness, and “floating” associated with traditional dentures. 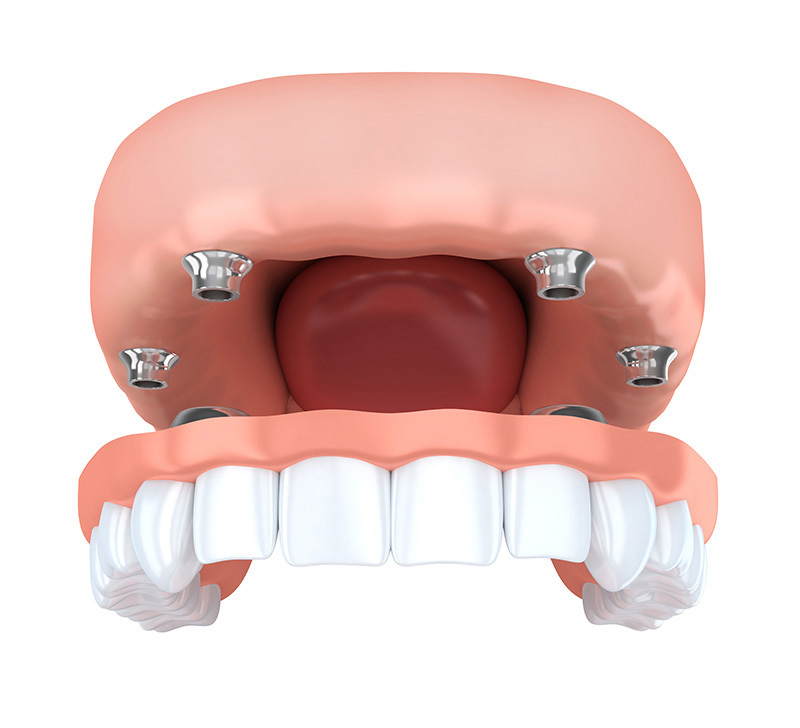 Traditional dentures are also designed to sit directly on top of your gums. This not only causes physical discomfort, but can also lead to bone deterioration and complications like clicking sounds or a loose fit. Teeth-In-A-Day can be placed into both upper and lower jaws. Because they are secured by dental implants, they reduce the risk of bone deterioration that can occur if you are missing teeth. These implant-supported teeth are designed to look, feel, and function just like your natural teeth. Traditionally, dental implants require time to heal and properly bond to your bone. It is important to make sure that the implant posts in your jaw begin to heal and fuse properly with the bone so that your restoration will be secure and functional and so that you avoid any potential complications during or after the healing process. This healing process usually takes around three to six months. However, with Teeth-In-A-Day, this waiting period may be reduced or eliminated entirely. Our periodontists can often replace your missing teeth in just a few short hours with Teeth-In-A-Day! When you complete your Teeth-In-A-Day treatment, our periodontists will begin by evaluating your current condition, including any existing teeth, whether or not you already wear traditional dentures, how your bite should be, and how much lip and facial structure support is needed. A digital X-ray or a 3D CT scan will be taken to provide our periodontists with a detailed image of your jawbone and anatomy, including the position of the teeth to be replaced to help them determine the ideal location for your implants. Dr. Ryan Mendro and Dr. Lucia Roca Mendro can then perform the procedures necessary for your Teeth-In-A-Day . The procedures including tooth extraction, bone shaping, and the implant placement itself can often be completed in a single visit. Your Teeth-In-A-Day will feel and function like your natural teeth, allowing you to smile with renewed confidence. We invite you to contact our office today at 407-378-0877 for more information about Teeth-In-A-Day and to schedule your consultation with our talented periodontists.